Your child’s growth and development during the middle school years will set the stage for high school and beyond. Unique to Vernon and area, is our separate Middle School (MS) program. Our approach with middle school is to meet the developmental and the specific and unique learning needs of grade seven through nine students. The goals for our MS program are to establish a sense of community, build individual character, encourage growth of unique gifts & talents while teaching students personal accountability. Our school is built upon knowing, caring for and praying for each student. Because of this, VCS students do not fall through the cracks. We are quick to be responsive, sensitive and supportive to students who are struggling with their place whether it be academically, socially or spiritually. Our staff serve as Christian role models who provide guidance and function as advocates and academic mentors for their groups during advisory time. Our MS team strives to create an environment that fosters relationships within the group so that students feel accepted and valued by both teachers and peers. Weekly Chapel is a time for our students and staff to gather as a Christian community to worship, praise, reflect and learn. We welcome the participation of our students’ families. Academic Intervention (AI) is intended to support our MS students in assignment completion and ensure assignments are submitted for grading. AI support is offered after the school day for MS students and others as needed. The fall retreat assists with breaking the ice and kicking off the new school year for our 7th, 8th and 9th grade students. 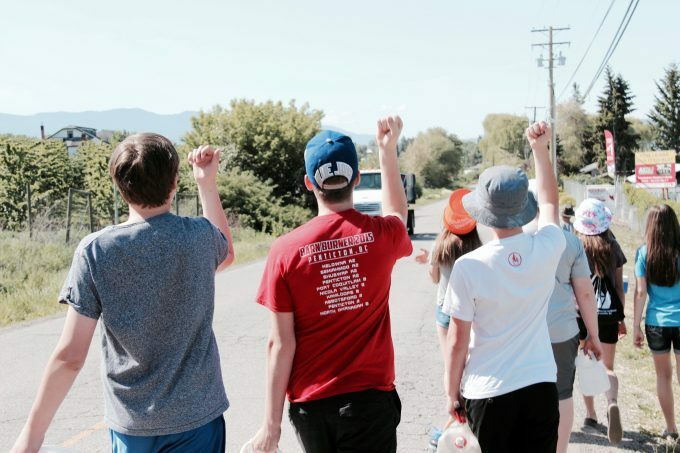 Held early in the school year, the students and faculty spend two days away from school at a selected camp facility where games, activities, and messages encourage spiritual growth, bonding and teamwork. The Junior Leadership Team involves dedicated MS students who are enthusiastic in their support of the school and student body. The Junior Leadership Team assists in planning student activities, school spirit events and socials. Junior Leadership also serves as a voice for the 7th, 8th & 9th grade students. We offer extracurricular athletic pursuits to our MS students through a variety of sports and teams. It is impressed upon our athletes that through their actions and words they bring glory to God’s name whether on or off the court or field. Our student athletes grow in athleticism with great coaching – promoting teamwork, healthy living and sportsmanship. Christ-centered and community-minded, VCS prepares students for lifelong leadership and service. Throughout the year we coordinate a broad selection of local community service placements. Even in the primary years, our students start serving in preparation toward our Grade 9 cross-cultural trip to Mexico. Through these outreach experiences we desire to impact our local and global community in response to the call to love both God and neighbour. For further information about our Middle School program, please contact our SC Vice Principal Mel Armanini marmanini@vcs.ca or call 250.545.7345 ext 23. For enrolment questions, please use this link to access the Admissions Enrolment Inquiry form. MySchool is a simple to use online administration platform for our staff and parents to access. Click the link below to login.